There are many factors that determine the interest rate on your mortgage. The most frequently asked questions that buyers and homeowners ask are, “What’s my rate” (even before an application is filled out), or “How is my mortgage rate determined” or “why is my rate higher than what is advertised on TV or radio? or “Do you see rates increasing when I am ready to buy in a few months?”, With these questions in mind, here is information you can use that will help you better understand the different factors that will determine the interest rate on your home loan. It is no secret that having good credit scores are important for buyers in this market to score the best rates, and this is especially true for conventional rates. For example, check out this chart below, a buyer with a 690 credit score purchasing a $400k home with 20% down, has to pay an additional 1.5 points ($4,800) to get the same rate as a buyer with a 740 score, or if they choose not to pay the points, instead they have to take a .375% higher interest rate (which will incorporate these points). A buyer with a 660 score, has to pay 2.5 points to get the same rate as a 740 buyer, which amounts to $10k on a $400k loan. 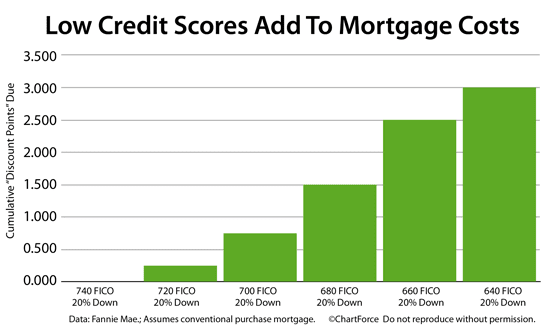 So having good scores is important to score the best rates on conventional financing. To maintain great credit, everyone should review a copy of their credit report once a year, so when you are ready to get financing, this will ensure you are always in a position to score the best rates. As a California resident, you are entitled to a free report once a year directly from the credit bureaus. I have a section on my website devoted to helping clients better understand and improve their credit scores, so they can qualify for the best interest rates. Click HERE to see this section. There are several other factors that determine the interest rate on your loan. For example, the amount of equity you have in your home also decides what rate you get. Someone putting down 40% or a homeowner with 40% equity in their home, will get a lower rate than someone who puts down 20% or has 20% equity in their home, just like someone with 20% equity will get a lower rate than someone with 5% equity in their home. The type of property you buy or own also determines the interest rate on your loan. For example, the rate is higher for 20% down on a condo versus 20% down on a single family residence. A tip is to put down 25% on a condo, then the rate is the same for a condo as a single single family residence. The loan amount you borrow will also effect your interest rate on your loan. Rates on loans <$484,000, which is the conventional loan limit, will have a lower rate than a loan >$484,000, which is considered a conventional jumbo loan. The conventional jumbo loan limit is $690,000 in San Diego and $726,525 in Los Angeles counties for example, each county in CA has it’s own conventional oan limit. An investment property has a higher rate than a primary residence rate. Banks consider buying an investment property a higher risk than a primary residence, and thus price it accordingly. A down payment of 20% is also the minimum down payment for an investment property purchase. Borrowing cash out on your refinance will also affect your rate. For example, someone borrowing cash out to pay off some credit cards or home improvement, will usually always have a higher rate than a loan not taking any cash out. If you want to remove the monthly mortgage insurance “PMI” from your mortgage payment, the rate will be higher than a mortgage with monthly PMI. All you have to do is take a slightly higher interest rate than normal, say from 4.5% to 4.75%, and we use a lender credit with the higher interest rate to eliminate the PMI from the mortgage payment. This is also known as lender paid mortgage insurance. Apples to apples the overall monthly mortgage payment with No monthly PMI will be lower than the loan with monthly PMI. As you can see, there are many different factors that have to be taken into consideration when determining the interest rate on your loan. There is not a one-rate-fits-all when it comes to obtaining the best interest rates on conventional financing. The Relationship between Mortgage Bonds & Mortgage Rates, and why Rates can change 2-3 times a day. The reason that mortgage rates move up or down every day, is because Mortgage Bonds (MBS) are traded everyday just like stocks. They either go up or down in price on a daily basis. Here is a quick synopsis of how the mortgage bond market works, so you understand how rates are determined, and so you know when is the best time to lock in your rate. See below a snapshot of a trading chart from a mortgage bond trading company I subscribe too. This is where we watch rates and mortgage bonds trade live each day, so we can give our clients up to the minute interest rate pricing, so they get to lock in the lowest mortgage rates possible. When Mortgage Bond prices are moving higher, it means home loan rates are improving and moving lower—and when Mortgage Bond prices are moving lower, home loan rates are getting worse and moving higher. To go one step further—a red “candle” means that MBS worsened during the day, while a green “candle” means MBS improved during the day. Depending on how dramatic the changes are on any given day, this can cause rates to change as much as 2-3 times throughout the day, as well as on the rate sheets we start with each morning. This daily trading of mortgage bonds directly correlates to the mortgage rates we see every day from lenders. As bond markets are quite volatile these days, it is not unusual for mortgage rates to change 2 or 3 times in just one day. What this means is, the terms we quote in the morning may not be available in the afternoon if the mortgage bond market is trading negatively. This is why shopping around can hurt consumers looking for the best rates, as the rates you were quoted on one day, may not be available the next day. Please keep this in mind when reviewing rates and deciding when to lock in. Our goal is to give our clients the best possible rates available in the market. My company is approved with 47 different banks and lenders, and this includes the top 5 best rate lenders in the nation, so we will always have the very best rates available in the market to offer our clients. In housing markets like San Diego, a 5% or 10% decrease in purchasing power can make or break the difference for a buyer being able to afford a certain price range. There are many buyers who are right at the limits of their affordability, so when rates move higher, it means they cannot afford a higher purchase price range anymore. Because of the recent increase in rates, buyers who have been shopping for homes over the past several months, should get re-approved again to see what they can afford based on higher rates and payments. This will ensure they can still afford the purchase price range they are trying to buy in and they will not have payment shock when they get into contract. Compare this to current rates around 4.25%, so the cost of borrowing money to finance a home is still low. If you are a homeowner looking to refinance your current mortgage, now is a great time to lock in a rate. You should also look into shortening the term of your loan, as many homeowners with 30 year mortgages are switching to shorter term loans. For example, with today’s low rates, you can probably get a 25 year fixed mortgage that will allow you to keep your mortgage payment the same as your 30 year fixed payment, so you can shave some years off your mortgage. There are many homeowners with 30 year mortgages who are switching to shorter term loans. According to Freddie Mac, over the last quarter approximately 40% of U.S. households who did a refinance, refinanced out of the popular 30-year fixed rate mortgage, in favor of shorter loan terms offered by 15-year, 20-year and 25-year fixed-rate loans (see chart below). Low mortgage rates have been a catalyst. At today’s rates, homeowners with a 15-year loan term will pay 64% less mortgage interest than with a comparable 30-year loan, as a 15-year mortgage requires just $28,000 of mortgage interest per $100,000 borrowed. Whereas 30-year loans pay $81,000 per hundred-thousand dollars borrowed. As the payment on a 15 year mortgage is quite often too expensive for many borrowers to pay each month,a 20 year or 25 year fixed is also a great way to save interest over the term of a loan, as a 25 and 20 year payment is more affordable. We can even help homeowners refinance into a 27, 22 or 18-year fixed rate mortgage term too. This is called the “YOURgage” program, whereby you can choose any fixed term between 11 – 30 years on your mortgage. This is a great option for someone who has been paying on their 30-year mortgage for a couple of years, or for someone who wants to retire in say 18 years, but do not want to start their mortgage back on a 30 year term. Click HERE for more information how to qualify. P.S. Please join my Facebook page for faster updates on any new mortgage programs that become available and other industry news. Tags: How Are Mortgage Rates Determined? Why causes rates to go up or down, what causes mortgage rates to rise, why are mortgage rates so low? Will mortgage rates rise soon?